I really love red wine, but I love white wine too. After the first few successful years of my vineyard and in particular my Cabernet Franc vines, I realized it was time to expand and plant some white wine grapes. I was again faced with the dilemma of deciding which variety. I tasted through a whole bunch of French-American hybrids like Vignoles, Seyvel Blanc, Aurore, Vidal and the like. I've always liked these hybrids. As a matter of fact the White hybrids are excellent and compare well with white viniferas. But since I had some success with Cab Franc I checked on the cold hardiness and growth characteristics of some white vinifera varieties. 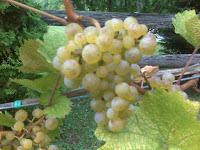 The ones that seemed to hold promise were Chardonnay, Pinot Blanc and, to my surprise, Riesling. I say this because I didn't want to grow Chardonnay. I just don't like it well enough and I would have chosen Vidal Blanc or Vignoles instead. Pinot Blanc was a possibility but Riesling... now Riesling has always held my interest of all the white wines I've ever tasted. It's steely acidity, hints of tropical fruits, green apple and the haunting aroma of petrol. I love it! If I could grow it in my backyard...no way! I did some more research and was thrilled to find out it is the hardiest vinifera white, hardy to nearly -10F and it can survive down to almost -16F. 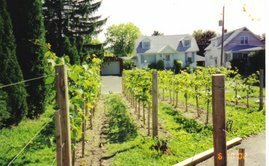 The most encouraging news was though, that some of the world's best Rieslings are being grown just 200 miles or so from my house in the Finger Lakes. And the variety ripens earlier than Cab Franc. That was it, Riesling it was. I planted 10 vines just to make a few gallons and it has been the easiest grape to grow and make wine with. It seems no matter what the weather is or what the numbers come in at, the wine is always good. The exciting thing is, just like the other varieties, I think this year's fruit gives me a shot at not just good wine but, dare I say, great wine. It was sweet, clean and balanced. I simply can't wait to see how it turns out. I'm very happy so far. The quality and taste of the juice was unprecedented for grapes from my vineyard, or even grapes I have purchased in the past. We'll see if my skills in the cellar can coax the best from this delightful fruit produced by God and Earth . I hope I know what I'm doing. If your winter lows don't average below -10F or if you're willing bury them, then try it. It makes very drinkable wine every year and when the weather is good, the wine gets really good. Thanks for your comment. What I'd be most curious about would be the temp during growing season. 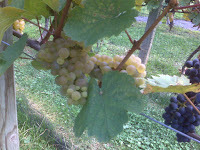 If you can grow Riesling in the inhospitable climate of Germany then you can grow it most anywhere there's a reasonable growing season for tree fruits such as apples, plums and peaches. In my vineyard I have had some cool and rainy weather during bloom. 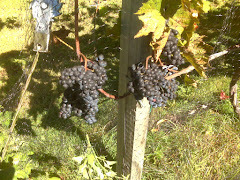 In those years fruit set is a bit lighter and there have been some vines affected more than others. I don't cluster thin until after fruit set just in case. It has never been bad enough to prevent me ffrom getting enough quality grapes to make wine with. It seems the only thing you may have an issue with is too much heat at ripnening. But you could also harvest earlier. Sounds like you could make some nice wine though. Any interest in Vionier? I'd love to grow it but I don't think it would ripen well here.